Avocado oil takes care of the dog’s coat, oils it and makes it easy to brush. It does not contain salt (does not irritate the delicate dog`s skin). Having the conditioner applied, the coat remains soft and shiny. The shampoo contains substances that have cleansing properties with the simultaneous ease of rinsing. Wheat proteins are very easily absorbed by hair and skin. Ideal for the care of dry and brittle hair. 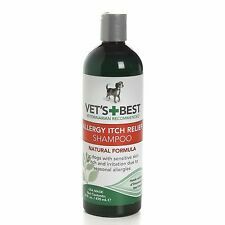 1 X Bottle of Vet's Best Allergy Itch Relief Shampoo 470ml, 16floz. Vet's Best Allergy Itch Relief Dog Shampoo is great for dogs with itchy skin due to allergies or sensitive skin. Directions for Use: Wet coat. Over whitening shampoo for Shih Tzu. Avocado oil take care of the dogs coat, oils it and make it easy to brush. It does not contain salt ( does not irriate the delicate dog skin). Over conditioner for Shih Tzu. A luxurious conditioner with. It does not contain salt ( does not irriate the delicate dog skin). 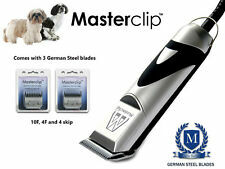 Masterclip TMPro Series A5 Sized Dog Clipper Blades. The Masterclip Pro Series range has been designed to give you top quality dog clipping blades, at an affordable price. These high precision blades are compatible with with Andis A5, Oster A5, Moser 45 and any other A5 clipper with snap on blades. Almond oil gives shine and silkiness. Conditioner allows easy combing of hair after washing. It gives it softness, shine and silkiness. Proffesional Dog CONDITIONER. ulatwia rozczesywanie. olej migdalowy nadaje polysk i jedwabistosc. Vet's Best Allergy Itch Relief Dog Shampoo is perfect for dogs with itchy skin due to allergies or dry and sensitive skin. Shampoo can be used as often as necessary to remove allergens without drying out your dog's skin. Vet's Best Allergy Itch Relief Dog Shampoo is great for dogs with itchy skin due to allergies or sensitive skin. Directions for Use: Wet coat. Apply shampoo evenly over the wet coat. Lather and massage for 3-5 minutes to allow lather to penetrate the coat and reach the skin. Pets will always shed, and as long as they live indoors, pet parents will need ways to reduce pet hair. The effectiveness of the extensive line of deShedding tools provides the rights solution for every shape, size and type of pet.FURminator deShedding Tools eliminate the frustration associated with shedding, and they keep coats healthy and beautiful. Package 1 x Pet Hair Brush (random color). Type SHIH TZU. Mower sold with 4 hooves (3, 6, 9, 12 mm) cleaning brush. Professional Dog Clippers. Cutting head adjustable from 0.8 to 2 mm without shoe. Sustainable product. Excellent quality and precision cutting. Type:100pcs Assorted Bowknots Female Pet Dog Cat Hair Bows Rubber Bands Dog Gromming Material:High quality, durable,colorful Apply for:Small dog & cat puppy. Feature: Diamond attached,backside with elastic bands, Bow knot design Color: Mixed color Wholesale price will help you to solve money Size： Approximately 4.0*2.0cm(1.6"*0.8") Note:Please feel free to send us message if you have any question,thanks. Type:Spooky Cat Dog Halloween Hair Bow Material: nylon Color:As picture shows Feature: Lovely Halloween Days Gifts with Color Print Butterfly Shape,Rhinestone/Pumpkin Attached Fit for Long hair dogs ,like shin Tzu Multi Color and design for you to choose ,you dog will love it Size Size:Length*Width*Height:1.8"*0.7"*0.5"(4.5*1.8*1.4cm) Note:Please feel free to send us message if you have any question,thanks. 10pcs/lot Christmas Pet Dog Hair Clips Santa Claus Hat Tree Xmas Dog Accessories Nylon Plastic, High quality,durable,colorful,cute for your pet. Fit for Small dog & cat puppy,e.g.Chihuahua,Poodles,Shih Tzu,Maltese,Yorkshire Terrier,etc. Multi Patterns:Christmas tree/Santa/Star/Bow knot,etc Mixed Colors:Red,Green(as the picture shown) Package:10pcs one pack Size： The biggest size approximately：2.0cm The smallest size approximately：5.0cm.